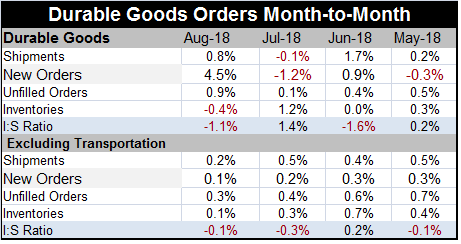 Orders gain 4.5% month-to-month in August, but excluding the transportation sector new orders rise by just 0.1% with shipments up a skinny 0.2%. Turning to shipments by sector, we find that shipments are growing faster than inventories in most sectors so that inventory-to-sales ratios are rising in only 42% of the sectors over three months and by a lesser percentage over broader horizons. Computers and transportation equipment show shipments are steadily accelerating from 12-months to 6-months to 3-months.‘Other durables’ and fabricated metal products show the opposite trend with shipments steadily decelerating. Over three months 57% of sectors show sales accelerating; that compares to 71% over 12 months. By value, 62% of sectors have sales accelerating compared to 73% over 12 months. The pattern for orders is less clear as new orders are accelerating in 28% of the sectors over three months and that proportion diminishes from 12-months to 6-months to 3-months. However, when it is re-expressed as the value of goods with orders accelerating, the proportion rises in 3-months compared to 12-months but still applies to only half of the value of orders at a percentile of 49.5. Obviously, there are mixed ends within industry. For durable goods over all the three-month growth rate of 9.6% is up from 7.5% over 12 months and shipment growth is well ahead of inventory growth which has been very low and stable. We can look in more detail at the key machinery categories especially in the wake of tax policy changes to see how investment has been affected. But these data lag by one month. Industrial machinery and equipment trends show a solid three-month growth rate of 9.9% which is down from its six-month pace but up from 4.2% year-over-year. Electrical equipment shows the opposite trend with a 7.1% pace over 12 months that drops to a 4% pace over three months. For electrical equipment, the weakness is sequestered in household appliances and in lighting where orders are declining on all three horizons. For industrial machinery, there is order weakness in metalworking and mining & oil field trends. The weakness in the oil patch is surprising but a year ago investment in that sector had grown by 48% year-over-year. There is strong growth with growth step-ups in engines & turbines, general industry machinery, material handling equipment and in equipment for ventilation and air-conditioning. Only the ‘other’ category and construction equipment have uneven trends. Overall trends in durable goods still look quite good. This month we set aside the strength in aircraft and when we do that we see a relatively listless month but that still comes amid very solid trends. If there is slowing in durable goods, it is quite new and ‘too new’ to be identified as such. The sector looks very solid with broad-based gains and only a few blemishes in its details. 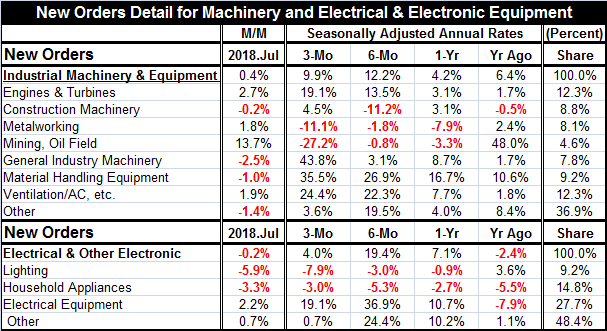 July was an uneven month for machinery investment with four of eight sectors showing declines and two of four in electrical equipment categories exhibiting monthly drops. But the up-to-date August aggregate report is very solid and with no hint of an inventory cycle. The sector appears to remain on sound footing.